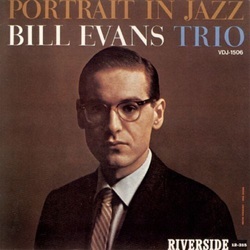 It’s probably fair to say that every jazz pianist alive today was influenced by Bill Evans—or, if not by Evans himself, then certainly by other pianists who were influenced earlier by him. Bill Evans brought to jazz a new kind of sound, one defined by his harmonies, his voicings, his touch, his use of space, and his phrasing. As Miles Davis heard it, “The sound he got was like crystal notes or sparkling water cascading down from some clear waterfall.” It was the sound Miles wanted in the music he recorded on the best-selling jazz album of all times, Kind of Blue, and why Evans was the primary pianist on that date. Moreover, Evans’s concept of the piano trio—piano, bass and drums—was equally influential in the history of jazz. In his first jazz trio, Evans introduced the idea of a more “democratic” musical unit, one with an integrated trio sound that encouraged greater interplay among its three members. “If the bass player, for example, hears an idea that he wants to answer,” Evans asked, “why should he just keep playing a 4/4 background?” This kind of melodically interactive trio, referred to by some as a “Golden Triangle” trio, is the standard in today’s jazz trios. In 1959, it was new. Breathtakingly so. That first Bill Evans Trio included the virtuosic bassist Scott LaFaro and the drummer Paul Motian, each an equal partner to Evans, each a powerful influence on the next generation of bassists and drummers respectively. Of the bassist, Evans commented, “In my mind Scott LaFaro was responsible in a lot of ways for the expansion of the bass. I think he is acknowledged, at least within musical circles, as being more or less the father or the wellspring of modern bass players.” And drummer Paul Motian was integral to the emergence of this new kind of piano trio—not one of a soloist accompanied by bass and drums but rather of three musicians who breathe, think and function as one. The first Bill Evans Trio recorded two studio albums and two albums that were produced from live sessions at the Village Vanguard. The first of the four albums was Portrait in Jazz. It was recorded just eight months after Miles Davis’s Kind of Blue, on December 28, 1959, at Reeves Sound Studios in New York City for Orrin Keepnews’s Riverside label. Originally released as an LP, it has since been re-released in CD format with bonus tracks. In 1961, Scott LaFaro was killed in a car accident at the age of just 26, an event that so devastated Evans that it was a full year before he began to re-group, finally replacing LaFaro with Chuck Israels. Over the many years before Evans’s own death in 1980, there were many iterations and personnel changes in the Bill Evans Trio and scores of wonderful recordings. None, however, exude the sense of adventure, discovery and pure joy of the first one.